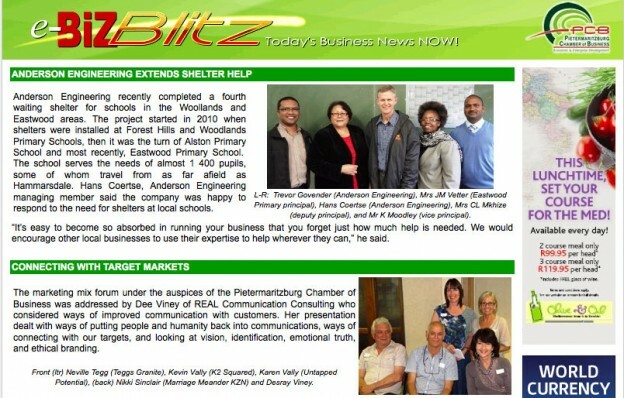 I recently addressed the Pietermaritzburg Chamber of Business and was featured in e-BizBlitz. I spoke about ways of putting people and humanity back into communications, ways of connecting with our targets, and looking at vision, identification, emotional truth, and ethical branding. You can view the e-BizBlitz newsletter by clicking here. This entry was posted in In the Media and tagged e-BizBlitz, PCB, pietermaritzburg on Nov 26, 2013 by Dee.